Why do hard and dangerous climbs? 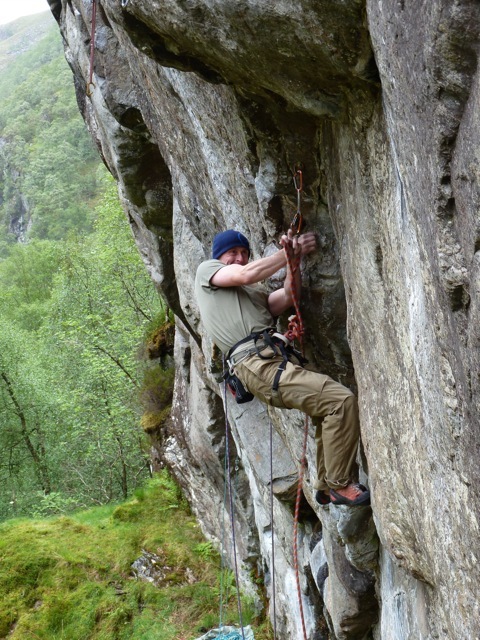 Just when we thought the Scottish spring couldn’t get any worse, going climbing has been even more difficult of late. 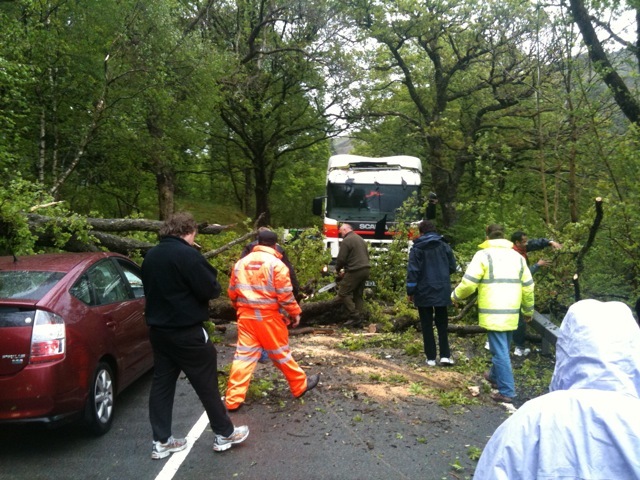 After a weekend in Glasgow and training indoors to hide from the 100mph winds, 60 odd fallen trees stood between us and home on the A82. The one below landed on the car and tanker, thankfully noone hurt and we proceeded to chainsaw it up and carry on. 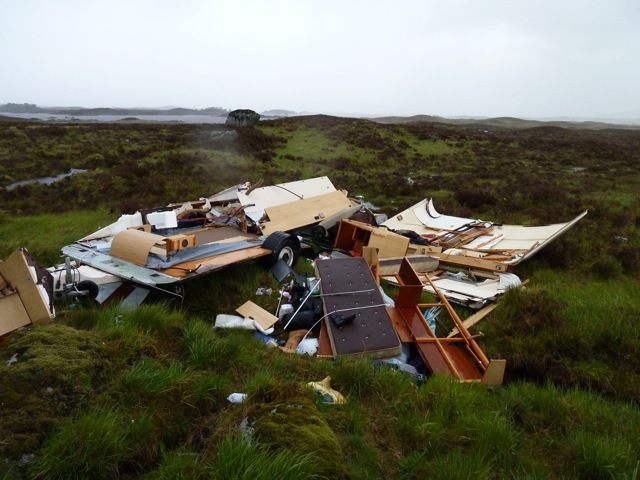 Further up the road, fallen caravans marked the way across Rannoch Moor. 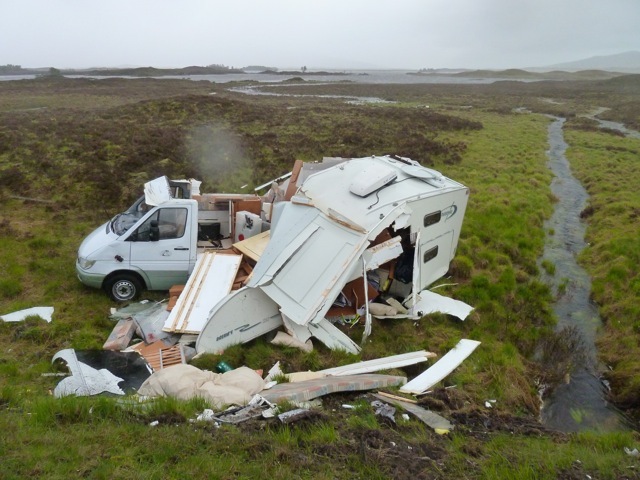 Yes, it used to be a caravan, until the Scottish conditions remodelled it. 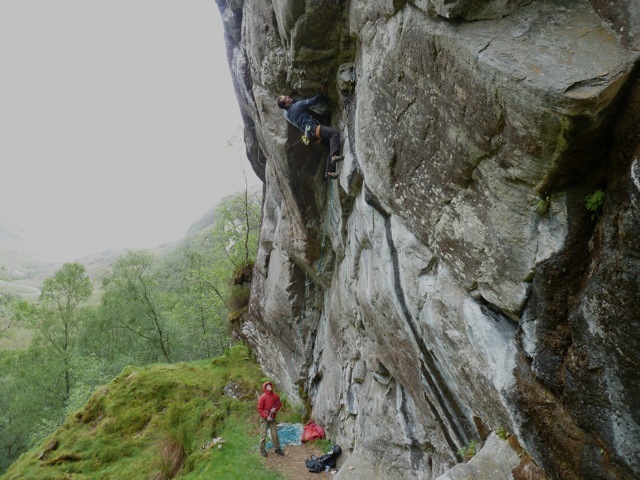 So the tour of Scotland’s perma-dry sport crags continues. Even Steall an Tunnel Wall were soaking, so I checked out Am Fasgadh in Gruinard Bay for the first time with Gaz and Murdo. 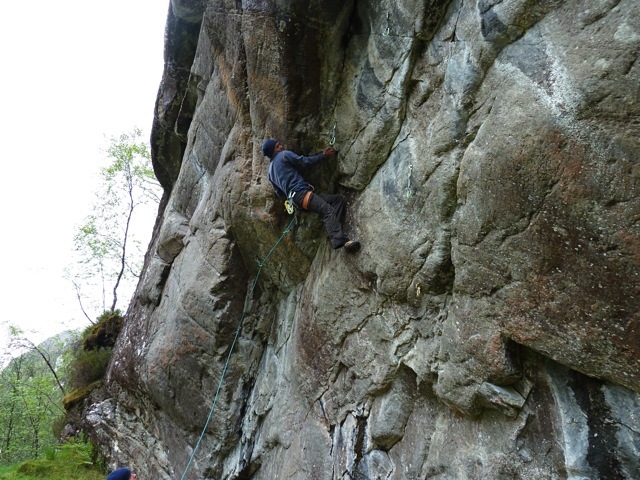 I was a fine little crag, and we managed half a session before the wind finally dropped and we received our first beating by the midges of the season. Before they stopped play, I managed an 8a+ second ascent (Stork’s ex project) and ticked some of the excellent 7bs and 7cs. 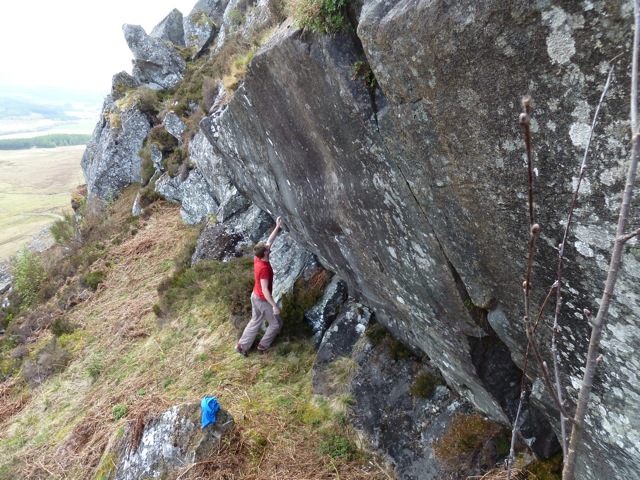 It was so nice just to go climbing on some established routes for a day, and not have to bolt and scrub them first! I forgot how easy it is just to climb other peoples sport routes. 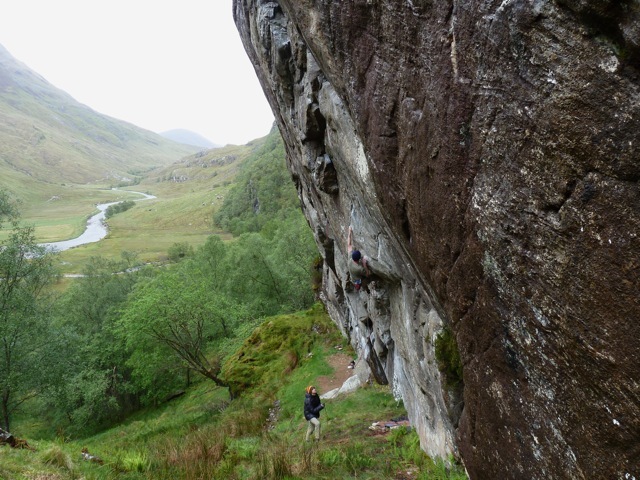 Two good sessions at Steall with Tweedley and Boswell. On day one I mostly put in bolts and scrubbed and was knackered. Net day, after baby class it was time to get actually climbing. 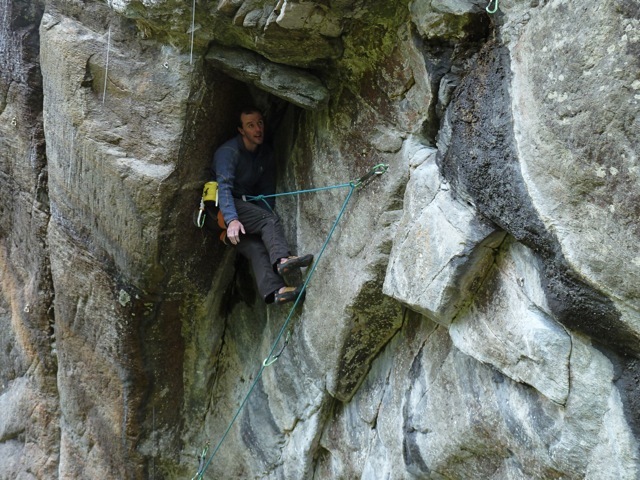 I equipped a big diagonal groove cutting across my route Stolen and Running into the last part of Trick of the Tail (which is now bolted to the niche below the perma-wetness with permission from Mark at great 7b+). Being a groove I figured some bridging would be possible, which it was in places. The rest however was some powerful fingery undercutting with some technical dancing about on little smears, if that is the right word? A little bit of grunt and I made it through to the superb upper section, with all sorts of funky groove moves going on. Brilliant. The other line I bolted won’t give up so easily I suspect. The whole time, it dumped it down with rain and fresh snow fell on Ben Nevis above us. I don't reckon too many other new routes got done in the western highlands today! Nice to see that other are enjoying the routes here recently as much as I have done. 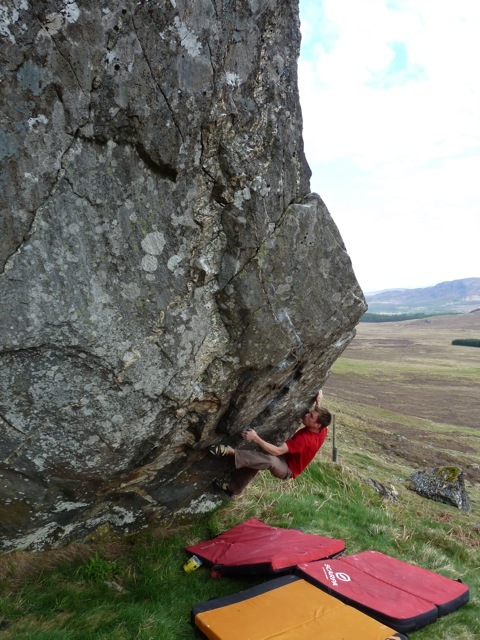 Niall and Alan both rating Stolen as possibly the best 8b or even 8 in the UK!! A project that’s been in the pipeline for a while has been a trip I’m planning with my sponsors Gore-Tex. It’s just launched so I can finally talk about it. So, would you like to come on a climbing trip to Arctic Norway with me? The lowdown is on the Gore-Tex Experience Tour facebook page here, but here’s the rough plan: Gore-Tex have been running several competitions to go on some superb trips with their athletes and this year it’s my turn. Some of you might remember I was asking you for ideas for it months ago. 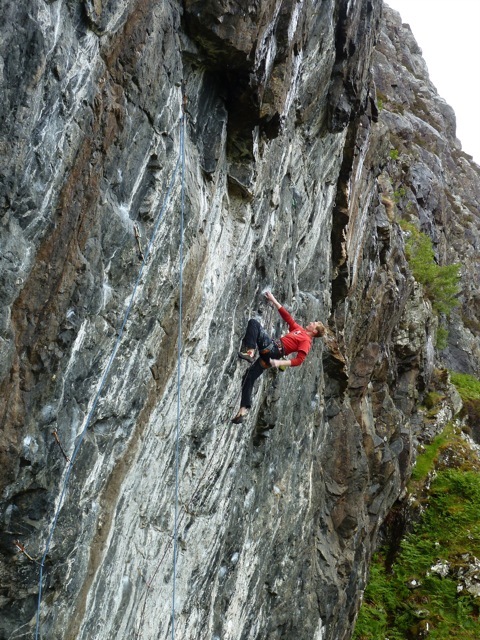 We are going to go rock climbing, hopefully new routing, in northern Norway for two weeks in August. 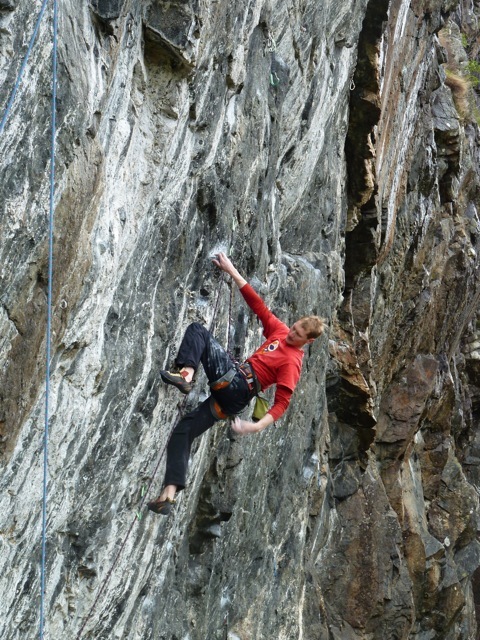 And we are looking for two climbers to win a place on the trip, courtesy of Gore-Tex! 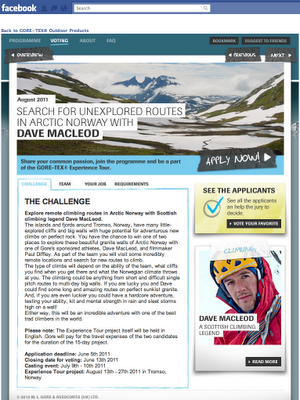 I see a load of you have already clocked this on the Gore-Tex Experience Tour facebook page and applied! Great stuff and good luck. 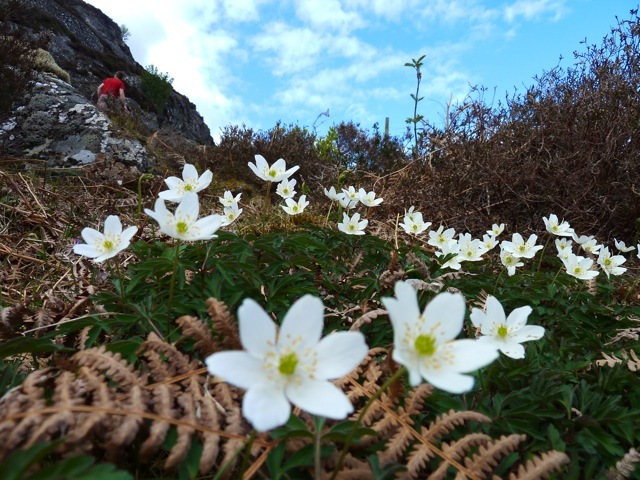 Looking forward to sharing a fine climbing trip with you. Please do post up on the wall with any more links you have to your climbing stories and pics to make my choice easier when it comes to the casting day! First off please don't be afraid to apply! 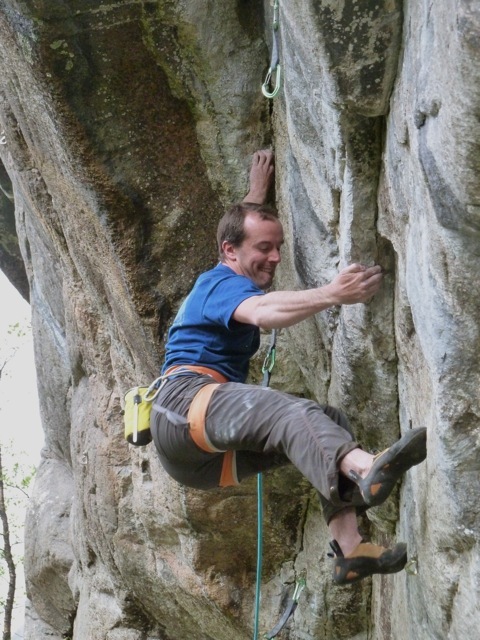 I know from experience of coaching climbers and doing talks etc that people sometimes get put off by the prospect of going climbing with someone you've 'heard of'. There's no need in this case. Climbing new routes in places where there's tons of rock offers endless possibilities and our objective is just to go climbing and have fun for a couple of weeks. We'll have no problems finding routes to climb that have however hard or easy climbing we are after. We'll choose the objectives when we get there and based on how we are all climbing. So it's flexible - the only hard and fast rules are that we will have an adventure, we will get rained on at some point, we will come home with tired arms and wide eyes. You get the picture.. 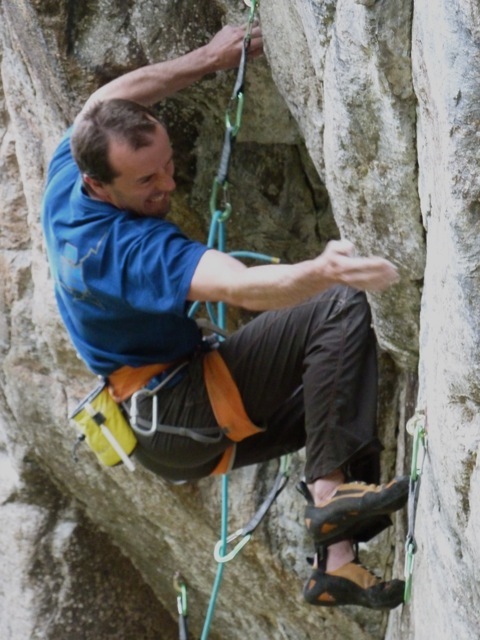 If you make the shortlist and get invited to the casting day in July, basically the plan will be we'll meet up near a cliff somewhere in Europe for the weekend, I'll show a few slides and tell some climbing stories over a beer. The next day we'll climb and find out who is ideal for the trip but I'll also make sure we all have a good session of climbing coaching so everyone has a good and productive time. Can’t wait. You can apply until the 5th of June, here. The sprint to the finish line on Seven of Nine seems to have left me feeling rather burnt out. Or has it? For the past five days I’ve felt unexpectedly lethargic, sleepy and ineffective at more or less anything. Time for a change of scenery. Almost every year I get a few days in both May and September when this happens. Whether it’s down to the change of season, natural cycles of training or something else, who knows. It doesn’t matter. It only lasts a few days and then I usually feel good again. This morning I woke up feeling normal again and psyched to start the routes season after yesterday’s false start. 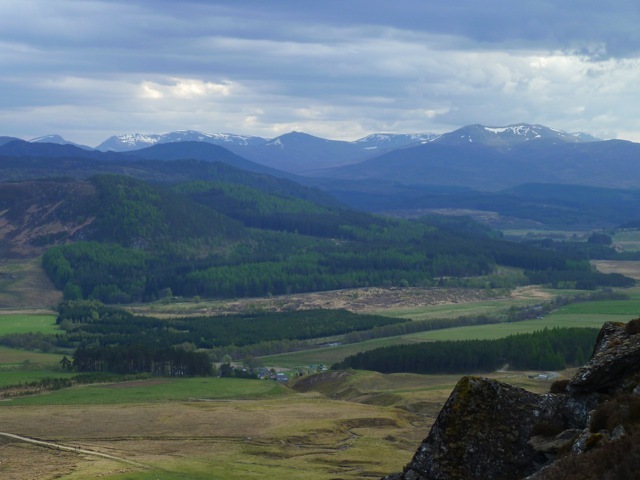 After sessions at Laggan, running laps on Sky Pilot for Cubby’s camera and then a day of failing miserably to climb anything at Tunnel Wall, I can see it’s time to phase out the boulders and start getting pumped on routes. I’ve got 6 weeks to get in shape for the start of the route project period. 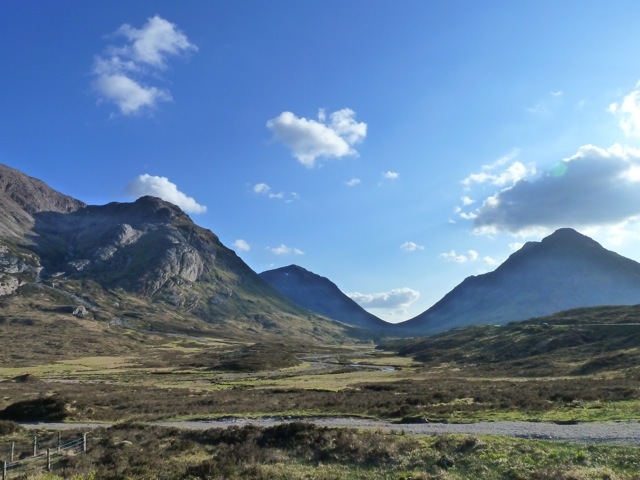 I’ll start off with a bit of Tunnel Wall and Steall, and then hopefully a bit of tradding. It’ll be interesting to see how quick the transition from strong to fit goes.